Serving as the premier venue in Northeast Seattle, The Mountaineers Seattle Program Center is a hub for Mountaineers events and activities, and community and corporate events for private and public organizations. Open to the public M-F 9am-5pm. Available for reservation upon request. 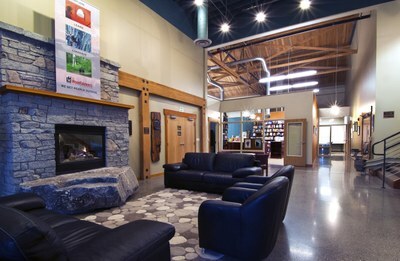 Serving as the premier meeting place in Magnuson Park and Northeast Seattle, The Mountaineers Seattle Program Center is a hub for Mountaineers-sponsored activities, and community and corporate events for a variety of private and public organizations. 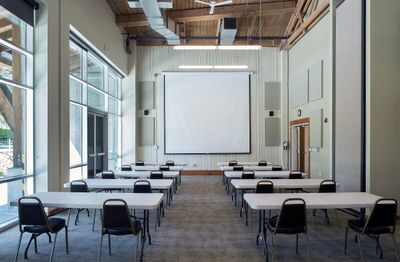 The Mountaineers Seattle Program Center's expanse and versatility lend to its popularity for those holding business conferences, annual meetings, lectures, workshops, film festivals, auctions and fundraisers. From meetings of 10 persons to festival seating of up to 500, we have the capacity and ability to meet most of your event needs. Prior to making a reservation request, please review our Seattle Program Center Events Calendar and Rental Brochure. If you are a volunteer and need to reserve a room for a committee activity, course or meeting, review our Schedule a Room at the Seattle Program Center how-to or if you already know how to reserve a room navigate to the All Events Calendar page to check availability and book! 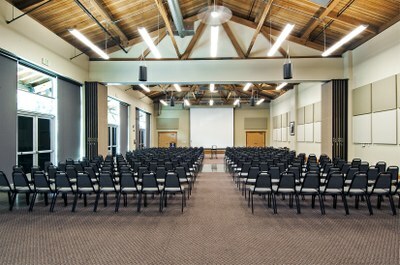 The auditorium boasts 20-foot-high ceilings, built-in projector screens, and a PA system. If the whole auditorium is too expansive for your needs, you can also choose to use a portion of the room separated by sound resistant air walls. The high ceilings and natural light from the wall of windows makes this room ideal for your board meeting, classroom session, or small social gathering. The high ceilings and natural light from the wall of windows make this room ideal for your board meeting, classroom session, or small social gathering. Seats up to 10 at the conference table with additional space for up to 25 people. Private space for up to ten people to meet. Space includes a TV monitor and phone conference ability. Our main lobby offers a comfy, fireside space to relax or engage in informal discussions during breaks from a conference or an event in another room. The lobby is available for use only if the whole facility is rented. Our bookstore has the best selection of outdoor titles you could ever imagine. We're normally open M, Tu, Th, Fr 9am-5pm and W 9am-7pm. Visit our bookstore page for other dates with extended hours and closures. Stop by and experience an outdoor book selection with no rival! The climbing wall and boulder in the South Plaza is open to the public and our indoor walls in Goodman C may be used by Mountaineers members during office hours. 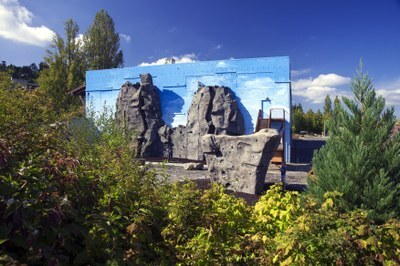 Anyone may use the climbing wall and boulder in the South Climbing Plaza at our Seattle Program Center in Magnuson Park. The South Climbing Plaza may be reserved for exclusive use, so please check the calendar for availability. Rules for using this facility are online and posted in the plaza. No gear is provided, so bring your own! To reserve the South Climbing Plaza for a non-Mountaineers event, please contact Magnuson Park directly. The facilities at the north end of our Program Center are for specialized use of our Aid & Big Wall and advanced rescue courses. The North Plaza may only be used via a Climbing Committee sponsored activity. It is reserved for such use via the committee room reservation process just as for any other committee use of the Seattle Program Center facilities. The indoor climbing walls in Goodman Auditorium may be used by Mountaineers members Monday through Friday from 9:00 a.m. to 5:00 p.m. as long as the room is not in use—check the calendar for availability. When you arrive at the Program Center, please check in at the front desk in the Bookstore. Top ropes are provided, but please bring your own personal climbing gear. Rules for using this facility are online and posted in Goodman Hall. Open Climb Nights are typically held every Friday night from 6:00 p.m. to 9:30 p.m. from October to February. They are supervised by one of our climb leaders. Top ropes, harnesses and belay devices are provided, but members and guests are encouraged to bring their own personal climbing gear. If you are not an experienced belayer, we encourage you to register for one of our Learn to Belay classes prior to attending an Open Climb Night. Rules for using this facility are online and posted in Goodman Hall. Check the Events calendar to ensure Open Climb Night is happening. Use of the climbing walls in Goodman Hall outside of the hours listed above may only be done via a Climbing Committee sponsored activity. It is reserved for such use via the committee room reservation process just as for any other committee use of the Seattle Program Center facilities. There are climbing training facilities in the basement that may only be used via a Climbing Committee sponsored activity. It is reserved for such use via the committee room reservation process just as for any other committee use of the Seattle Program Center facilities. This facility may be opened for more broad use in the future. Please check back. If you have more questions or want to use our indoor climbing wall outside of regular business hours, send us an email, info@mountaineers.org.